If there's a good word for the jobs you don't want to even attempt let alone actually complete, it's awkward. Not impossible: at least you can simply write those jobs off. No, the awkward ones are the real sods - technically you know you can do them, but it's going to be arduous. If I'm spending money on an expensive tool, I expect the company behind it to go the extra mile, to make my life easier. I'm not going to bang on about this, but the box itself... is ingenious. There are little icons moulded into the plastic inside, so that you can see quickly where the plug, drill, charger and attachable handle should go. This is hardly rocket science, but I've not seen it before, neither has Anthony. It makes so much sense, and facilitates a smooth and fast pack-away at the end of a job. Full marks for effort, Makita! If even the box is being helpful you could hesitate an assumption that the tool will be something special. There's a lot to go at here, with a boatload of whoomph courtesy of the 18v Lithium Ion battery and decent rubber grips to keep a hold of things firmly. The supplied attachable handle is very definitely going to be necessary, mind: something this powerful and of this shape and length will be unwieldy in a one-handed application. With it attached, it's a beast that's easy to tame. The chuck is, in fact, not keyless. At first appraisal this seems mildly archaic, but when you consider that Makita's other tools don't take this approach, we assume a good reason for this. The best guess on our part would be that, in order to create a mechanism compact enough to work at tight angles, a keyless setup would take up far too much room. 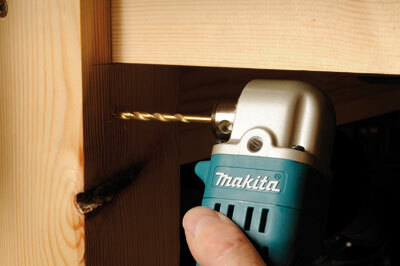 The chuck key system means that you've got effective hold in a small amount of physical room. More manoeuvrability, more purchase at tricky corners. Excellent. Along with a charger that works efficiently and tells you the score via a system of lights, everything here is designed to ease the passage of your work. You might not need one of these tools, but then again there's always going to be the odd screw or drilled hole that's just out of reach to the conventional drill. For the electricians, plumbers, specialist installers and shop fitters out there, this could prove invaluable in terms of time gained and hassle saved. Excellent stuff. "This could prove invaluable in terms of time gained and hassle saved"